His latest movie, “Dunkirk,” out July 21, takes him out of the fantasy world and into reality and the evacuation of Allied soldiers from that beach in France in May and June of 1940. 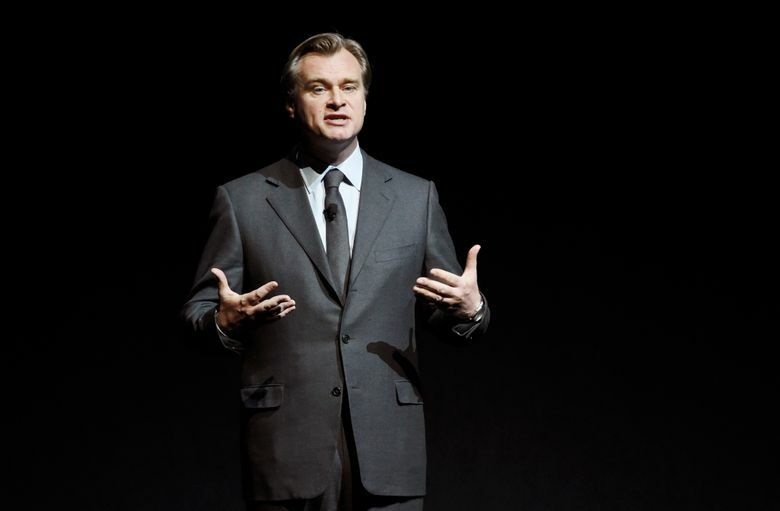 LAS VEGAS — Director Christopher Nolan has spent his career bending minds (and cities) with his films. He works on a scale that is stubbornly and obsessively cinematic and it seems that no concept, be it Batman or the multiverse or dreams, is too big for the visionary filmmaker. His latest movie, “Dunkirk,” out July 21, takes him out of the fantasy world and into reality and the storied evacuation of Allied soldiers from that beach in France in May and June of 1940. Nolan spoke to The Associated Press about “Dunkirk” at the recent CinemaCon in Las Vegas. A: As a filmmaker you’re always looking for a gap in cultural movies and Dunkirk is a story British people are raised on. It’s in our DNA practically. But it has not been addressed in the movies. So for me, it was a very exciting gap. I’ve spent a number of years trying to figure out what’s the angle of approach, what’s the angle of attack for getting the story across? So we came upon the notion of creating a very experiential film, one that rather than trying to address the politics of the situation, the geopolitical situation, would really put you on the beach where 400,000 people are trapped, surrounded by the enemy closing in and faced with annihilation or surrender. The fact the story ended with neither annihilation nor surrender makes it one of the greatest stories in human history. Q: How did you approach it? A: The approach is trying to take the full experience and put the audience there. What would it be like to be on the beach? To be on a boat trying to cross the channel? It’s a huge challenge, but exactly the kind of challenge that you look for in film. Q: You have said the film is less about character than survival. Can you explain what you mean? A: I feel like Dunkirk is such a universal event and it involves so many people that to try to encapsulate the specific detail of the human experience wasn’t the way to go. What we decided to do was to really try and live in the moment of the experience … the very immediate and human desire to survive. It’s the most human movie I’ve ever made because it’s about the desire for survival. We wanted to tackle that and make what I refer to as a very present tense narrative where you’re in the moment with the characters. You’re not necessarily spending too much time discussing who they were before or who they will be after. Q: This film has been rated PG-13. Was that a choice you made during production? A: All of my big blockbuster films have been PG-13. It’s a rating I feel comfortable working with totally. “Dunkirk” is not a war film. It’s a survival story and first and foremost a suspense film. So while there is a high level of intensity to it, it does not necessarily concern itself with the bloody aspects of combat, which have been so well done in so many films. We were really trying to take a different approach and achieve intensity in a different way. I would really like lots of different types of people to get something out of the experience. Q: Is there any truth to the report that the production bought a $5 million vintage plane to crash? A: No. We used real antique vintage planes and flew them for the movie but we also constructed full scale models to destroy. A lot of money was involved but not that much money. I would never! Obviously never … These planes are so beautiful and so valuable for so many reasons and the respect I have for them having done this, especially now having worked with them. The Spitfire is the most glorious machine. Q: And you tell the story from three points of view? A: The story needs to be told from different points of view intertwined. We spend time looking at various points of view. On the beach. In the air. Out on the sea. Q: Do you feel like you’ve evolved at all since “Interstellar”? A: It’s not really for me to speak to the bigger creative issues, but from a technical point of view, to me “Dunkirk” is a story that I’ve wanted to tell for a long time but did not have the technical expertise to be able to. We shot the entire film on large format celluloid film, which has never been done before. With each film we’ve always included some IMAX photography, but this film is almost entirely in IMAX and what isn’t is large format. It should be a very strong presentation.